Generally First Sat of the month is Karaoke . This is a fairly new pub, having opened circa 1970/71. 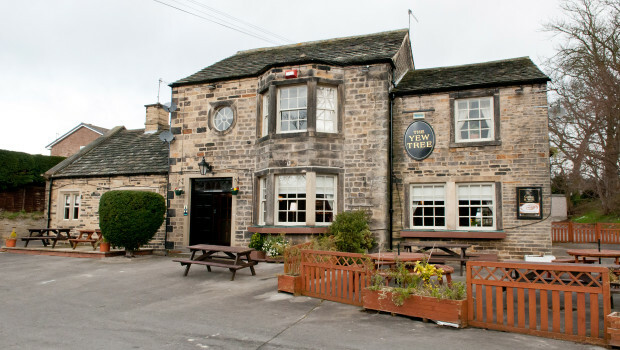 It is a 17th century building that was originally a farm and converted into the Yew Tree Pub. The house was built in three different sections, one section dating back some 400 years, another part 300 years and the newest around 200 years (which does not include its last alterations when it was converted into a pub). The first Licensee of the pub was Walter Barnes with his wife, Jessie. Other landlords that have followed include Mr. J.C. Metcalfe, Mr. B. Stafford who took over from Metcalfe in October 1988. In December 1989, a large advert appeared in the local newspaper stating that the public house had been extensively refurbished. Just about everything was new. Barry Stafford and his wife managed it. They were well known as they had managed “The Lix” on Bridge Street. Barry & Linda came in 2000 as Licensees and were there fourteen years on and they themselves had the Pub extensively refurbished in February 2014 . Go to the Gallery to see photographs of the refurbishment . Brett Booth was the landlord from 2015 till 2018 when Julia Ward carried on the tradition for the pub to continue as a local community pub . Julia had worked at The Yew Tree initially part time and now as the current landlady with the help of her family . Julia is a local lass who used to accompany her father as a young girl to the Yew Tree and consequently has a long association with the pub and its customers ..